Apolipoproteins are proteins that bind to lipids (oil-soluble substances such as fat and cholesterol) to form lipoproteins, which transport the lipids through the lymphatic and circulatory systems. The lipid components of lipoproteins are not soluble in water; however, because of their detergent-like (amphipathic) properties, apolipoproteins and other amphipathic molecules (such as phospholipids) can surround the lipids, creating the lipoprotein particle that is itself water-soluble, and can thus be carried through water-based circulation (i.e., blood, lymph). Apolipoprotein E (APOE) is a class of apolipoprotein found in the chylomicron and IDLs that binds to a specific receptor on liver cells and peripheral cells. It is essential for the normal catabolism of triglyceride-rich lipoprotein constituents. ApoE mRNA first appears as monocytes differentiate into macrophages, and this expression is paralleled by the secretion of ApoE by the cells. In mature macrophages ApoE synthesis and secretion are decreased by activation of macrophages with endotoxin and interferon-gamma. Although these macrophages contain abundant translatable ApoE mRNA, little ApoE is synthesized, suggesting that this decrease occurs largely at the translational level. ApoE is also controlled at the level of secretion. ApoE is concentrated in the Golgi complex of macrophages and is also found in endoplasmic reticulum, secretion vesicles and coated vesicles. When macrophages come in contact with immune complexes the intracellular ApoE compartment degranulates rapidly. Therefore, ApoE is regulated at the levels of secretion, translation and transcription. Apolipoprotein E has two functional domains. These two functional domains of apoE are separated by thrombin cleavage, which produces two fragments: a 22 kDa fragment at the amino-terminus of the protein, which contains the receptor-binding domain of the protein; and a 10 kDa fragment at the carboxyl-terminus of the protein, which contains the lipid-binding domain. carboxyl-terminal domain, molecular interactions between these domains are functionally important. apoE3 (both with Cys112) do not display this domain interaction, resulting in preferential binding of HDL. Some studies indicate that alteration of sterol content does not regulate macrophage apoE production at a translational or post-translational locus but that incubation with HDL3 or phospholipid vesicles can enhance apoprotein E production independent of changes in apoE gene transcription or apoE synthesis. The results of some studies indicate that newly synthesized apoE in the macrophage can be degraded in an intermediate density nonlysosomal cellular compartment, which is sensitive to proteasomal inhibitors. Alteration of cellular lipid homeostasis by preincubation in sterol/oxysterol or acetylated low density lipoprotein inhibits apoE, but not total protein, degradation in this fraction. Inhibition of the degradation of apoE in this fraction likely contributes to the increased apoE secretion observed in sterol-enriched cells. Apolipoprotein E has critical roles in the protection against atherosclerosis and is understood to follow the classical constitutive secretion pathway. Recent studies have indicated that the secretion of apoE from macrophages is a regulated process of unexpected complexity. Cholesterol acceptors such as apolipoprotein A-I, high density lipoprotein, and phospholipid vesicles can stimulate apoE secretion. 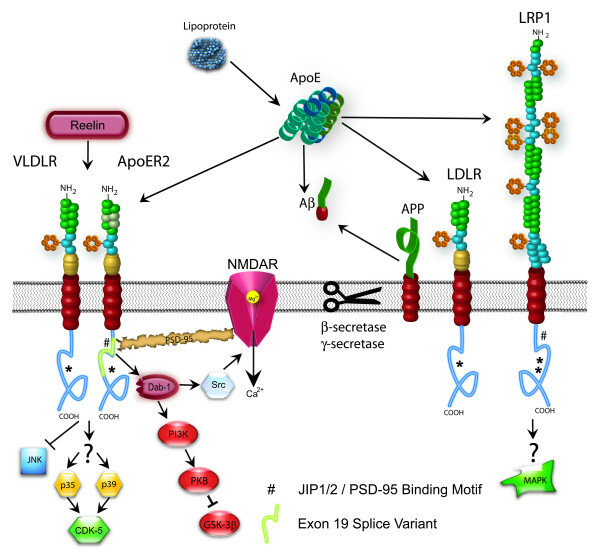 The ATP binding cassette transporter ABCA1 is involved in basal apoE secretion and in lipidating apoE-containing particles secreted by macrophages. However, the stimulation of apoE secretion by apoA-I is ABCA1-independent, indicating the existence of both ABCA1-dependent and -independent pathways of apoE secretion. The release of apoE under basal conditions is also regulated, requiring intact protein kinase A activity, intracellular calcium, and an intact microtubular network. Mathematical modeling of apoE turnover indicates that whereas some pools of apoE are committed to either secretion or degradation, other pools can be diverted from degradation toward secretion. The e4 version of the APOE gene increases an individual's risk for developing late-onset Alzheimer disease. People who inherit one copy of the APOE e4 allele have an increased chance of developing the disease; those who inherit two copies of the allele are at even greater risk. The APOE e4 allele may also be associated with an earlier onset of memory loss and other symptoms. It is not known how the APOE e4 allele is related to the risk of Alzheimer disease. However, researchers have found that this allele is associated with an increased number of protein clumps, called amyloid plaques, in the brain tissue of affected people. A buildup of toxic amyloid beta peptide and amyloid plaques may lead to the death of neurons and the progressive signs and symptoms of this disorder. It is important to note that people with the APOE e4 allele inherit an increased risk of developing Alzheimer disease, not the disease itself. Not all people with Alzheimer disease have the APOE e4 allele, and not all people who have this allele will develop the disease. Variants of apolipoprotein E have been studied extensively as risk factors for many different conditions. For example, APOE alleles have been shown to influence the risk of cardiovascular diseases. People who carry at least one copy of the APOE e4 allele have an increased chance of developing atherosclerosis, which is an accumulation of fatty deposits and scar-like tissue in the lining of the arteries. This progressive narrowing of the arteries increases the risk of heart attack and stroke. The APOE e2 allele has been shown to greatly increase the risk of a rare condition called hyperlipoproteinemia type III. Most people with this disorder have two copies of the APOE e2 allele, leading researchers to conclude that the e2 allele plays a critical role in the development of the condition. Hyperlipoproteinemia type III is characterized by increased blood levels of cholesterol, certain fats called triglycerides, and molecules called beta-very low-density lipoproteins (beta-VLDLs), which carry cholesterol and lipoproteins in the bloodstream. A buildup of cholesterol and other fatty materials can lead to the formation of small, yellow skin growths called xanthomas and the development of atherosclerosis. APOE gene variants have also been studied as a potential risk factor for age-related macular degeneration, an eye disease that is a leading cause of vision loss among older people worldwide. Some studies have suggested that having at least one copy of the APOE e4 allele may help protect against this disease or delay the onset of vision loss, while having at least one copy of the APOE e2 allele may increase the risk of this disease or cause symptoms to appear earlier. However, other studies have not found these associations. More research is needed to clarify what role, if any, APOE gene variants play in the development of age-related macular degeneration.